Did you know that Janet Mills once sponsored a bill to give $800,000 in taxpayer cash to her friends who said they wanted to make a film in Maine? Well she did! As we know, one of the most important things a Governor does is balance the state budget and save money for a rainy day. 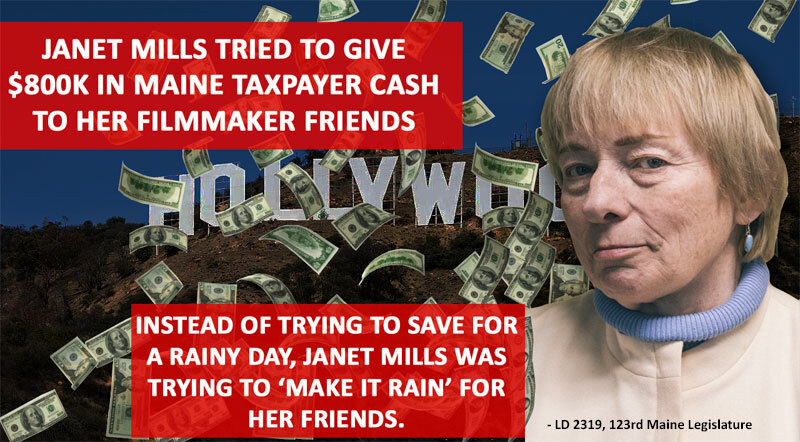 In 2008, however, as a rainy day was approaching, Janet Mills was trying to “make it rain cash” on her filmmaker friends instead of saving state tax dollars for the most important needs of the state. Incidentally, despite Janet Mills’ attempt to fork over $800k of your money in four $200k yearly installments to her filmmaker friends, they went and made the movie somewhere else. And the movie ended up only making $135k in the domestic box office. Janet Mills sure knows how to pick ’em.